The Astronomy Club of Asheville has donated three 4.5-inch Orion StarBlast Reflector Telescopes (f/4.0; 450mm focal length) to the Asheville-Buncombe County Library System for use by the community as loaners. The telescopes are located at the Pack Memorial Library branch located in downtown Asheville. You do not have to be a member of the Astronomy Club of Asheville to borrow a telescope; you must, however, have a valid library card and be 18 years of age or older to check out the equipment from the library. Younger members of the community may have one of their parents check the telescope out for them under their supervision. 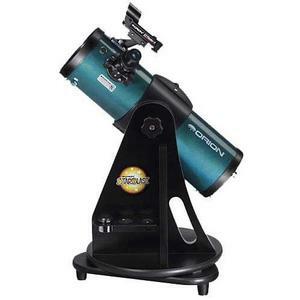 These are fine beginner, astronomical telescopes that will display some of the wonders of the Moon, the planets, and the stars to the patient and inquiring user. The Astronomy Club of Asheville is proud to be the sponsor of this community telescope loaner program and to be partnering with the Asheville-Buncombe County Library System. While you may reserve the telescope online or through your local library branch, the equipment must be picked up at (and returned to) the Pack Memorial Library branch in downtown Asheville. For the current library status of the Orion Starblast telescopes, follow this link. Find out about the Asheville-Buncombe County Library System’s contact info, hours of operation, locations and more at this website. Click here to complete an on-line survey about the library telescope loaner program.